Abstract: Microalgae has prospects as a feedstock for biofuels production. The challenge with microalgae is the intensity of treatment processes required during cultivation and harvesting. Dewatering is one of the most critical processes in the production of microalgae, which accounts for 30-45% of production costs. Energy efficient techniques that could improve dewatering would reduce processing energy requirements. In this study a central composite design (CCD) using response surface methodology (RSM) was used to optimize the retention of microalgae. For the investigation, a Britt Dynamic Drainage Jar (DDJ) was used in combination with KAl(SO4)2 (alum) as a flocculant. The DDJ is an instrument used in paper research to simulate the turbulent conditions obtained on the wet-end of a paper machine. 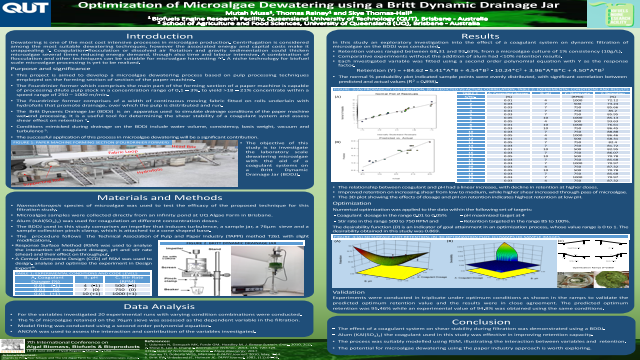 Turbulent dewatering of microalgae is expected to provide high throughput, in order to investigate this the effects of pH, shear and flocculant dosage were considered. A regression equation was fitted to the data using analysis of variance (ANOVA) and numerical optimization was applied to maximise retention. The model predicted a retention of 95% under optimal process conditions (pH=4, flocculant dosage=0.05% and shear rate=545 revolutions per minute (RPM)). This was validated experimentally yielding a retention of 94.8%, which illustrated the adequacy of the model in predicting the design space. The results show the prospects of obtaining high microalgal retention by flocculant assisted dynamic filtration. Summary: This study was conducted on a laboratory scale to test the amenability of microalgae for dewatering on the wet-end of a paper machine (Fourdrinier former). This involved using the Britt Dynamic Drainage Jar (DDJ) an instrument developed to simulate the turbulent conditions obtained on the paper machine in a laboratory. The findings were relevant and a pilot scale test will be considered in furtherance of this study.References: 1. Uduman N, Danquah MK, Forde GM, Hoadley M. J. Renew Sustain. Ener., 2010, 2(1). 2. Show K, Lee D, Chang J. Bioresource Technol., 2013, 135, 720-729. 3.IEA. State of Technology Review – Algae Bioenergy, 2017.